It’s a thing out here in the Los Angeles area small theaters, to have wine available for a “donation” before the show, and again at intermission. This post is for those Small Theater Producers who regularly commit all sorts of wine crimes against their audience; but the rest of you feel free to listen in. Dear, wonderful, brave Small Theater Producers. We really need to talk. I know your love for theater is why you put up with having no budget, actors who go missing because they’re getting a day’s pay by working in a commercial or (more frequently) doing background work (because you can’t afford union contracts), and basically worry about paying the bills. I also know you serve wine to patrons of your theater in the hopes that you’ll make money (and quite often, you do – because only half of the 56-seat theater actually has butts in the seats, but half of those folks didn’t pay squat to get in because your cast is desperate for an audience and no one can find your theater without Siri barking directions at them plus lets not even get into the no parking situation, or the dicey neighborhood you’ve chosen). When patrons arrive at your place, they’re tired, cranky, their feet hurt and they would much rather be home but instead they’re standing in front of you, staring doubtfully at your wine selection and praying it’s not total dreck. A little wine can loosen up a cranky audience. I get it. Truly. But please, if you’re going to serve wine, please don’t get the cheapest wine you can (that you wouldn’t drink for love nor money) and then charge a $5 donation for three measly ounces. First, three ounces of wine isn’t going to make us like your production more. Second, cheap wine leaves a bad taste in the mouth, which we’re going to unconsciously equate with your production. Which means we’re not going to tell anyone we saw your show, thus killing that much-needed word-of-mouth advertising. So here’s my white wine choice for you. Don’t think, just go buy, and thank me later. Yes, I said don’t go cheap. Yes, this bottle is under $10, which qualifies in the cheap range. But no. Cheap, to me, is any bottle of wine that you wouldn’t happily drink yourself. This wine is inexpensive, true, but it is TASTY. So, 1.5 liters of wine at under $10 a bottle means you, dear Theater Producer, can fill that plastic cup to the brim. Make that theater goer happy, and they might grab another glass of wine. Or two. They may even buy their ticket price in wine. You can “accidentally” make enough on wine sales to make it look like you actually had a full, paying house! Wouldn’t that be fantastic? Plus, two people buying a glass of wine, and that bottle has been paid for. Oh, and please – by all that is holy – keep the Chardonnay COLD. Yes, grab a big ice bucket. Have a cooler somewhere. Get all classy. Because warm Chardonnay is almost a worse crime than a short pour of bad Chardonnay. Next week, I’ll talk about red wines for you Small Theater Producers (because I’m running out of time and need to get to work). 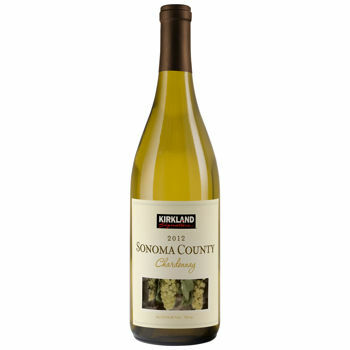 Until then, stock up on the Kirkland Chardonnay and fill those cups, people! Your patrons will thank you, and they in turn will appreciate the show much more. Who knows? You may even get some positive word-of-mouth advertising out of it! This entry was posted in Wine Friday and tagged 99 seat contract, chardonnay, Equity Waiver, Los Angeles, Tom Ashworth, Wine Friday. Bookmark the permalink. Hi Christine! Since I live alone and try to budget (TRY) a $10 bottle of wine isn’t ‘cheap’. But it’s about what I’d spend if I was sharing the wine. What really frosted me was being served Oak Leaf (I think that’s the cheap one at Wal Mart?) at a no host bar where we were paying $7.00 for a tiny glass. Not even Charles Shaw! I’ve always thought rule of thumb for wine pricing was about the same price per glass as we’d pay for a bottle, so this was outrageous not to mention really mediocre wine. And of course they were stingy on the amounts. Really folks? You want us to come back to your pathetic offerings? Oh no, Mona! I hope this wasn’t at a theater! Oak Leaf – I haven’t tried that. (Not a WalMart fan.) And I’m not saying price equals quality; I can currently find a Beringer white for under $4 at the grocery, and I tend to like Beringer wines. (For my personal consumption, under $10 is what I always look for.) But yes, I agree. If you’re pouring wine for a “donation” (because theaters don’t have liquor licenses, and therefore can’t “sell” wine), at least make sure it’s TASTY wine! I agree. I don’t need the wine to be the best part of the show, but if it was my small production, I’d select that wine as carefully as the lead actors!